This special feature showcases AAV's most valuable asset--our members--by highlighting our diverse backgrounds, professional activities, experience, and geographic locations. What was the first bird job you ever had? I only worked with cats and dogs until I started working at Windcrest Animal Hospital almost 10 years ago. They needed an exotic technician. I was anxious to learn these new skills. I had some exposure to parrots through friends. But I found out that birds are my passion. I love attending the AAV annual conferences. It is wonderful to meet and share experiences, tips and tricks with others that share my passion. What is your favorite avian species and why? I love Amazons. I find them to be highly intelligent and entertaining. Windcrest has a Mealy Amazon as a hospital pet. She and I bonded shortly after I started working there. It has been love ever since. Best benefits of AAV membership? The ability to share ideas with others that love birds. The ability to communicate through Facebook and get relevant information on the AAV website. Also some of the lasting friendships I have made. If you had not chosen your present career, what would you be doing? I always wanted to be a veterinarian. But since I wasn't financially able to pursue that career, a licensed technician is the next best thing. I help one of our vets teach an exotic class for a local technical school that has an accredited Vet Tech program. One of my favorite classes to teach is Exotic Radiology. During the lab portion, I teach the students to take radiographs of various exotics. One of the most memorable moments is when we took rads of a hen. The students were excited to see that she had an egg in her coelom. But after she awoke from anesthesia, she laid the egg on the x-ray table. I don't think the students will ever forget that. AAV Members: We invite you to submit your member spotlight to be featured in this section of our AAV NewsLink. Don't be shy! Submit your spotlight questionnaire today! During my summer right after my first year in vet school I worked at Chouette à voir!, a birds of prey rehabilitation center in St-Jude managed by the UQROP (Union québécoise de réhabilitation des oiseaux de proie) which is affiliated with the Birds of Prey Clinic of our university. I am in awe with the Great Horned Owl because of one particular bird from my summer at Chouette à voir!. We received an owlet that could not go back into the wild. We made the decision to train him with other birds, which were in the same situation as he was, so that he could become an ambassador! I saw him grow from a small fluffy feather ball that could fit in the palm of my hand to a 1.5kg adult bird who made his first flight with me! If I did not embark myself in the journey that is vet school, I would have taken the path of human medicine as a cardiologist! I finally made up my mind after a short observation internship at the Biodôme of Montreal, in which I saw the thrill of dealing with more than one species! What was your favorite class or activity in vet school/vet tech school/college? Organizing and presenting the ''Bird of Prey: Emergency techniques'' wetlab for the students from across Canada during the Student Canadian Veterinary Medicine Association (SCVMA) Symposium with the help of Dr. Guy Fitzgerald. 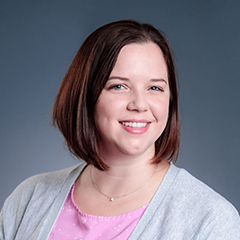 Andrea Winkel-Blair, DVM, MPH, is a graduate of Michigan State University in East Lansing, MI, where she completed her Bachelor of Science degree in Zoology with a concentration in zoo and aquarium sciences. She then went on to earn her Doctor of Veterinary Medicine from Michigan State University in 2009. She earned her Masters in Public Health from University of Minnesota in 2010. She went on to join the US Army Veterinary Corps in 2009 where she was an active duty captain. After 4.5 years she decided it was time for a change and left the Army for private practice. Dr. Blair was in private practice for about 1 year before she decided that she wanted to go back for a 3-year residency in avian medicine at Texas A&M University. She currently is at MedVet Hilliard in Columbus, OH where she has been part of the medical team since 2018. 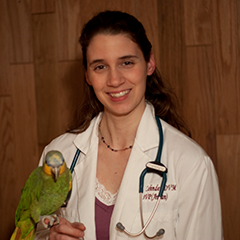 She is passionate about Avian & Exotic Medicine and her special interests include exotic behavior medicine, avian surgery, avian reproductive medicine, raptor medicine, and reptile medicine and surgery. Dr. Blair is also excited about being elected as the incoming Chair of the Association of Avian Veterinarians Aviculture Committee. She is an active member in Association of Avian Veterinarians, Association of Reptile and Amphibian Veterinarians, Association of Exotic Mammal Veterinarians, American Veterinary Medical Association, and Ohio Veterinary Medical Association. Dr. Nikki Becich, member of the AAV since 2014, is a 2018 graduate of Tufts Veterinary School. She is currently working with exotic companion and small animals at Cheat Lake Animal Hospital in West Virginia. Dr. Becich also works with the Avian Conservation Center of Appalachia, a non-profit organization started by Katie and Dr. Jesse Fallon which aims to treat and rehabilitate wild birds, as well as educating the community in the importance of local species conservation. She has worked as an international field associate for programs in Ecuador for the National Aviary since 2013. This position has allowed her to work against wildlife trafficking in South America, and work extensively in inter-situ Andean Condor conservation efforts between North American and Ecuadorean institutions. In January and February, Dr. Becich has been in Ecuador working with Bioparque Amaru Zoo to train veterinarians in avian medicine basics. Her time in Ecuador also helps the National Aviary better communicate with the organizations working in Ecuadorean Andean Condor conservation. The hope is that in the future, Amaru will be a leading in-situ site for Andean Condor breeding programs, and with support of the National Aviary gain accreditation with the Associacion Latinoamericana de Parques, Zoologicos, y Acuarios (ALPZA, The Latin America Zoo, Park, and Aquarium Association). The National Aviary and Amaru support the Fundacion Condor Andino and the Neotropical Peregrine Fund, who are leading Andean Condor research in the field. She hopes to continue conservation work with wildlife centers and zoos for all her career, and appreciates the opportunities and connections offered by working with the Association of Avian Veterinarians. Ashley Zehnder graduated from the University of Florida College of Veterinary Medicine in 2005, completed a small animal medicine and surgery internship at the Animal Medical Center in New York City in 2006 and a 3-year residency in Companion Avian and Pet Exotic Medicine at the University of California-Davis, becoming boarded in Avian Medicine in 2009. She completed her Cancer Biology PhD in the Khavari Lab at Stanford in 2016, working on novel therapeutic strategies to target altered signaling pathways in epithelial cancers. Since beginning her research training at Stanford, she pursued interests in cancer biology as well as comparative medicine by maintaining active research interests in both fields. She spearheaded the Zoobiquity Research Symposia in 2014, 2016 and 2018 which brought together veterinarians and human medical researchers to discuss research efforts in infectious diseases, cancer as well as novel animal models of disease. More recently, she co-founded a research alliance to bring together medical professionals to pursue research interests relating to cancer in non-domestic species, shedding light on the biology of tumors in these potentially valuable animal models (www.escra.org). Her post-doctoral research focused on building resources and methods to improve sharing of animal clinical data across the US as well as developing a tumor database focused on non-domestic species, thereby helping to identify potential novel models of cancer for human and animal research. Currently she is the co-founder of Fauna Bio, a drug discovery company built on comparative mammalian genomics that was launched from her post-doc lab at Stanford. Dr. Anthony Pilny is a graduate of the University of Florida’s College of Veterinary Medicine. He completed an internal medicine and surgery internship at Florida Veterinary Specialists in Tampa, Florida and a residency in Avian and Exotic Pet Medicine and Surgery at The Animal Medical Center in New York City. He is a diplomate of the American Board of Veterinary Practitioners certified in Avian Practice since 2005, and currently serves as vice-chair for the maintenance of certification committee. 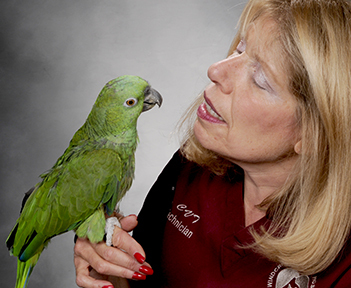 Dr. Pilny has lectured nationally and internationally about avian and exotic pet medicine and has published numerous scientific articles and book chapters on birds and other exotic species. Dr. Pilny is a member of the Association of Avian Veterinarians, Association of Exotic Mammal Veterinarians, Association of Reptile and Amphibian Veterinarians, and the Southern California and American Veterinary Medical Associations. He currently serves as the National Medical Director of the House Rabbit Society and serves on the advisory boards of The Avian Welfare Coalition and One Earth Conservation. 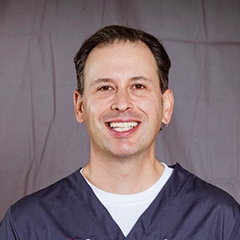 Dr. Pilny is currently an associate veterinarian in the Department of Avian and Exotic Pets at ACCESS Specialty Animal Hospitals in Los Angeles, California. 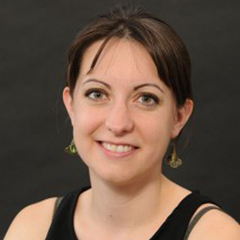 Dr. Claire Grosset graduated from Alfort School of Veterinary Medicine in France in 2008. She completed a specialized internship in Zoological Medicine at the Université de Montréal and a residency in Companion Avian and Exotic Pet Medicine at the University of California, Davis. She became an ACZM Diplomate in 2014. She has a passion for research in exotic animals including companion avian species and birds of prey, and currently works as a clinical instructor at the Faculté de Médecine Vétérinaire of the Université de Montréal, Canada. Dr. Olivia Petritz completed her undergraduate and veterinary degree at Purdue University in Indiana. 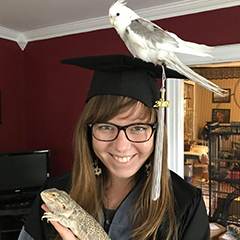 Following graduation, she completed a small animal medicine and surgery residency at a specialty hospital in San Diego, CA, followed by an exotic animal internship at Gulf Coast Avian and Exotics in Houston, TX. Dr. Petritz returned to California to complete an ACZM residency at the University of California, Davis in companion exotics and zoo medicine, and achieved board certification in November of 2013. She then started an exotics service at a specialty hospital in Los Angeles and worked there for three years prior to joining the faculty at North Carolina State College of Veterinary Medicine as an assistant professor of avian and exotic animal medicine. I worked in Bird Hospital of Veterinary College of the National Autonomous University of Mexico. In this place I conducted research on the Prevalence of Macrorhabdus ornithogaster in budgerigars, canaries and finches. In April 2018, I worked with Dr. Jaime Samour and other members of AAV in a video about celioscopy and endoscopy in falcons. I love parrots, especially lilac-crowned parrots. My first parrot pet was a lilac-crowned parrot, It was very ill and was abandoned at the Bird Hospital of Veterinary College. He is so smart, lovely and friendly. What was the last interesting avian medical or surgical issue you dealt with in your work? I have seen a chick parrot with pentadactilism (5 toes in each foot). It will be necessary to perform a phalangectomy, because these extra toes are deforming the feet. All the information to which we have access, because some avian veterinarians in Mexico don't have much money to do internships or clinical residency in others parts of world. AAV and the Journal of Avian Medicine and Surgery provide important information to help us in some avian medical cases. I worked on a loon mortality research project with Dr. Mark Pokras at the Tufts Wildlife Clinic. Loons from all over northern New England were brought to Tufts to determine why they died. I helped to perform necropsies, compile data, and write up the results. The study found that lead poisoning from swallowing fishing sinkers was the major cause of death of otherwise healthy loons. I presented two case report posters at AAV conferences, one on lockjaw caused by Bordetella avium in a cockatiel, and the other on a Candida keratitis in a lovebird. The process of writing up these cases and creating the posters was a great experience. I have had many favorite birds over the past 20 years of working as an avian veterinarian. Lately I am really enjoying working with pet chickens. I have chickens of my own, and they are wonderful and comical birds. Seeing them as patients is an interesting combination of individual and flock health. I have seen a number of otherwise healthy hens present with acute stroke-like symptoms. While the cause of the neurologic injuries were never determined, we were able to rehabilitate them back to being happy hens. I have one of them as a pet, and her quirkiness makes me smile every day. The Journal of Avian Medicine and Surgery and the annual conferences are both great educational resources. Years back I was a reviewer for JAMS and I enjoyed that quite a bit. Last year I joined the AAV's Education Committee and am helping them create informative handouts for clients. Offering bird owners an alternative to all the misinformation the internet has to offer is a very worthwhile endeavor! I was pre-med in college and intended to go into human medicine. I suppose that would have been my alternate career, but being a veterinarian is way more fun! I went into veterinary school wanting to specialize in birds. While there I took every avian class my school had to offer, but there weren't many of them in 1994. My real avian medicine education has come from mentors, colleagues, journals, conferences, and VIN. Do you have a favorite tip or trick for clinical avian practice that you can share with AAV members? Find veterinary technicians interested in exotic practice, train them well, and treat them like gold. They are the best assets you will ever have! To view additional member spotlights from past years, click here.